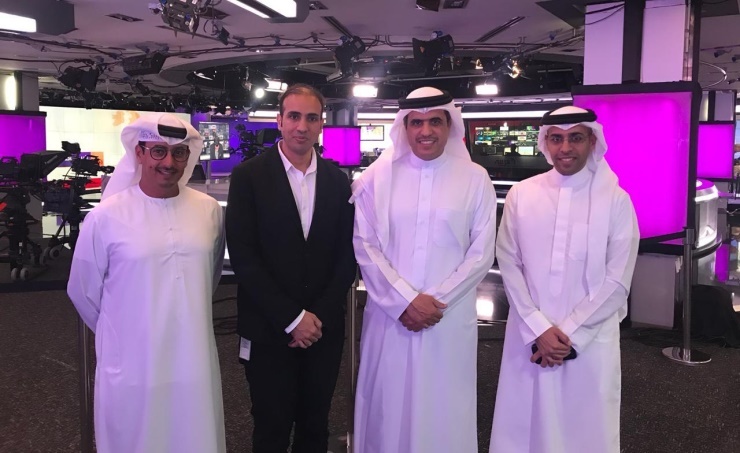 Dubai, Feb.9 : Information Affairs Minister Ali bin Mohammed Al-Romaihi visited “Al-Arabiya” and “Al-Hadath” TV channels at the Media City, in the emirate of Dubai. The minister paid the visit on the sidelines of his participation in the World Government Summit, being held on February 10-12, under the patronage of UAE Vice President, Prime Minister and Dubai Ruler His Highness Shaikh Mohammed bin Rashid Al-Maktoum. He met “Al-Arabiya” and “Al-Hadhath” deputy director-general Mamdouh Al-Mehaini and “Al-Arabiya” Officer in charge of the UAE affairs Abdulla Al-Mutawa and discussed media and technical cooperation, exchanging information and expertise in the audiovisual and electronic media. The minister toured news and production studios and editorial rooms at “Al-Arabiya” and “Al-Hadhath” TV channels, hailing advanced human resources, media broadcasting technologies and competent technical capabilities. He commended the professional and objective news programmes and coverage aired on “Al-Arabiya” and “Al-Hadhath” TV channels, focusing on key regional and international issues, as well as steadfast media stances in confronting extremism and terrorism. Hey Buddy!, I found this information for you: "Information Minister visits “Al-Arabiya” and “Al-Hadath” channels". Here is the website link: http://www.mia.gov.bh/2019/02/09/information-minister-visits-al-arabiya-and-al-hadath-channels/?lang=en. Thank you.